The email address is invalid, please try again. You'll receive more info about IPO Pro in your inbox soon. In the meantime, start exploring the platform with a free 7-day trial of IPO Pro now. Everything you need to know about IPOs in one platform. Navigating through the IPO market is a challenge for investors of all levels. 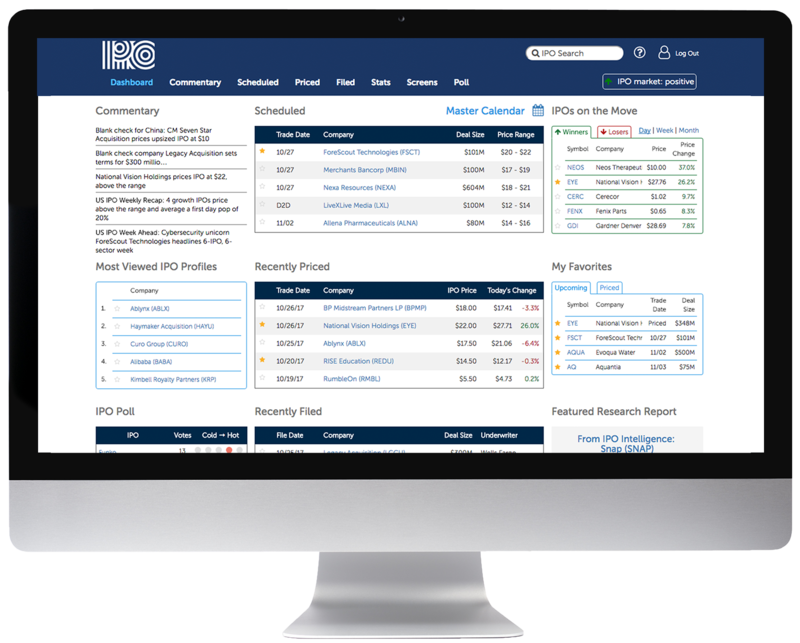 IPO Pro is designed to give you the tools and trusted data you need, all in one place, to help you succeed with your investing goals. Start a free trial to see how IPO Pro can help you. IPO Pro is a place where all of your IPO data comes together, so you can find all of the deal info you need, as soon as you need it. Before investing in new offerings, study the full IPO profile to get a feel for the deal, the underwriter, management and industry. Never miss an IPO. Use a detailed IPO calendar equipped with filing, pricing, street research inititation and lock-up dates. Renaissance Capital has been the trusted source of IPO data on Wall Street for over 25 years. We aren't called the "IPO Experts" for nothing. Receive IPO alerts straight to your inbox. Get weekly calendars and special alerts for IPOs you flag as favorites. No matter your job title or interests, IPO Pro can help you save time and make smarter investments. Hundreds of people around the world already used IPO Pro to make smarter investments. I've saved time gathering information and getting an overview of the IPO market as a whole. Gives me a quick overview of coming deals so I can prioritize my effors and save time. I wanted to avoid having to search several sites to get info on IPOs / looking for a centralized info source when i found IPO Pro.